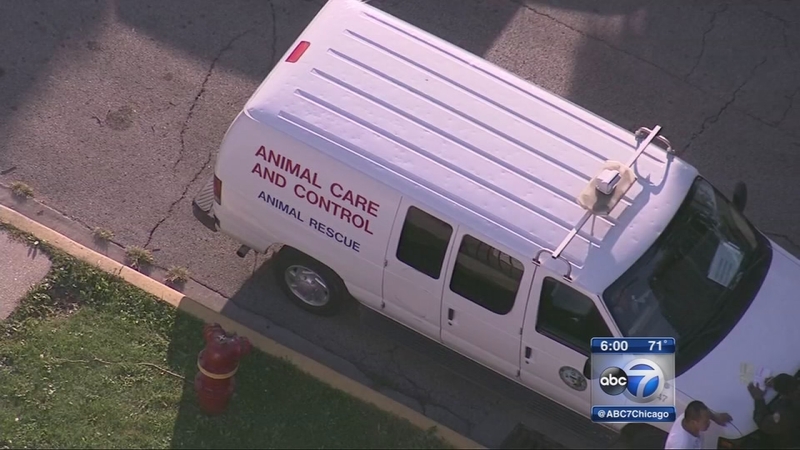 CHICAGO (WLS) -- A dog attacked two people in the Gage Park neighborhood on Chicago's Southwest Side. Police and animal control officers responded to a home near 51st and Fairfield around 4 p.m. Tuesday. Police said an 8-year-old girl and a 56-year-old woman, who neighbors say is the girl's grandmother, were taken to Mt. Sinai Hospital. The girl is in serious condition while the woman is in critical condition, officials said. Neighbors said the dog belongs to the family and the girl was playing with a group of dogs, three or four, outside of the home when the one dog in question bit her on both legs. According to neighbors, the child's grandmother came out of the house and brought the girl inside. She then went outside and was also attacked by that same dog. Fire officials said the woman was mauled, and was bit on both her upper and lower body. "I feel so nervous, so scared, sad because I know that lady. I see how she looked, and there was a lot of blood," said Martina Zabala, a neighbor. Neighbors say two of the dogs have lived here for years and are generally friends, but the third dog just started living here a few months ago and that dog may have been the one involved in the attack. Neighbors said at least one dog, a pit bull, was taken away from the home. No charges or citations have been issued, police said.